14th annual awards use data-driven methodology based on cost-of-ownership to identify the best value fleet vehicles in each segment. LOUISVILLE, KENTUCKY, USA, April 15, 2019 / EINPresswire.com / -- The 14th annual Vincentric Best Fleet Value in America™ Awards were announced today with Nissan and Infiniti combining to win 11 awards while Kia also showed a strong fleet presence with an impressive seven award winning vehicles. Key to the strong Nissan performance were the three awards earned by the NV Van lineup, led by the NV 200 S which won for the sixth consecutive year. Infiniti did its part in the luxury segments, delivering two sedan winners and two SUV/Crossover winners. The strong Kia performance was led by its Niro lineup, winning both the Hybrid and EV/Plug-in Hybrid segments in the SUV/Crossover category. General Motors and Ford Motor Co. continued to show a strong fleet lineup with four award winners each, while Mercedes-Benz Vans and FCA were close behind with both earning three Vincentric awards. Other winners included Toyota with two award winners along with BMW, Subaru, Volkswagen, and Volvo who each had one Best Fleet Value in America winner. 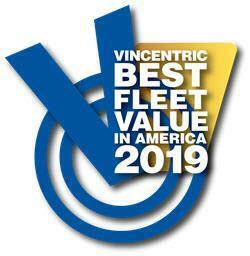 To determine the 2019 Vincentric Best Fleet Value in America™ Awards, Vincentric performed a cost of ownership analysis measuring over 2,500 vehicle configurations based on typical fleet use. Using eight different cost factors – depreciation, fees & taxes, financing, fuel, insurance, maintenance, opportunity cost, and repairs – each vehicle was evaluated in all 50 states plus D.C. using 28 different lifecycle scenarios. Winners were identified by determining which vehicles had the lowest fleet lifecycle cost in the most scenarios within its segment. Further information regarding all of the winners of the 2019 Vincentric Best Fleet Value in America Awards™ and the Vincentric methodology is available at www.vincentric.com . Vincentric provides data, knowledge, and insight to the automotive industry by identifying and applying the many aspects of automotive value. Vincentric data is used by organizations including Mercedes-Benz, Toyota, NADA Guides, Business Fleet Magazine, Nissan, and many others as a means of providing automotive insight to their clientele. Vincentric, LLC is a privately held automotive data compilation and analysis firm headquartered in Bingham Farms, Michigan.